I feel like it went from Spring to Summer in the blink of an eye. Okay, maybe it's because we have been traveling for the better part of a month, but all of a sudden it just got hot! Which means it's ice cream season! Not that I need any special season to help myself to some ice cream, but it certainly helps with the thermometer is pushing 90 or 100 degrees. I also can't get enough fruit during the Summer, especially strawberries, which is why I thought I would combine one of my favorite strawberry desserts with a bit of ice cream for the ultimate Summer treat. Everyone makes their strawberry shortcake with whipped cream, but why not throw a little ice cream in there instead and call it a strawberry shortcake ice cream sandwich!? The shortcake in these strawberry shortcake ice cream sandwiches is the most intensive step in the process. But if you can make a biscuit, you can make shortcake! Trust me, homemade shortcake is well worth the moderate effort it takes to make them! Start by mixing together flour, sugar, baking powder, baking soda, and salt. Then add in the chilled and cubed butter. Cut the butter into the dry ingredients until it resembles cake crumbs. You can use two knives, a pastry cutter, or your hands. I used a combination of a pastry cutter and my hands. Pour in the milk, just a little bit at a time. Mix until a sticky yet firm dough forms. It's okay if you don't use all of the milk. 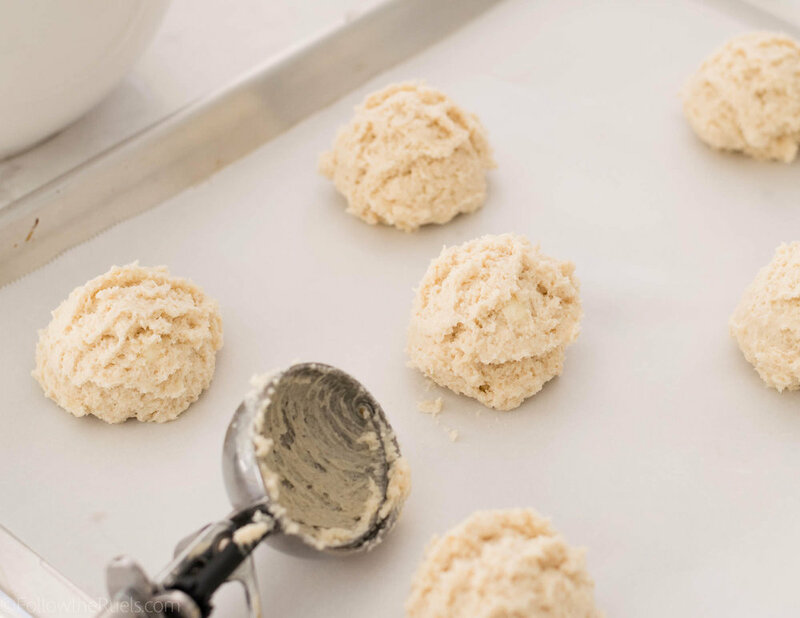 Since these are drop biscuits, drop the dough using a spoon or ice cream scoop onto a lined baking sheet about 2-3 inches apart. If you want a flatter shortcake (easier to actually eat as an ice cream sandwich), press the biscuit down with your hand. Then brush the top with a bit of melted butter and sprinkle with some coarse sugar. Then pop in the oven and bake until golden. Fresh strawberries are best for strawberry shortcake, but if you also want your strawberries to be extra juicy and create a strawberry syrup to drizzle down the ice cream, I recommend tossing them in a bit of sugar. Slice your strawberries however you prefer, then sprinkle over about 1-2 teaspoons of granulates sugar. Toss the strawberries to coat, then let sit for at least 10 minutes, or while the shortbread bakes. Assembling the strawberry shortcake ice cream sandies is the best part! Slice the baked and cooled shortcake in half like a hamburger bun using a serrated knife. Then pile on the strawberries. Top the strawberries with a healthy scoop of your favorite vanilla ice cream and even more strawberries. Top it off with the other half of the shortcake and you have yourself a delicious Summer treat! Preheat oven to 400 degrees F. Line two baking sheets with parchment paper and set aside. In a large bowl, combine flour, sugar, baking powder, baking soda, and salt. Whisk to combine and get rid of any clumps. Add in butter and cut into dry ingredients using two knives, a pastry blender, or your hands until the mixture resembles cake crumbs. Pour the vinegar into the milk and stir. Pour the about half milk mixture into the other ingredients and stir to combine. Add any additional milk until a sticky dough forms. Spoon or scoop the dough onto the prepared baking sheets. Brush with the melted butter and sprinkle the top with the coarse sugar. Bake for 15-20 minutes, or until the tops are a light golden brown. Meanwhile, mix together the strawberries and sugar until strawberries are lightly coated. Let sit for at least 10 minutes. Once shortcake has cooled, cut in half using a serrated knife. Fill with strawberries and ice cream, then top with other half of the shortcake.